These are some of the key findings from the latest Pew Research Center estimates based mainly on U.S. Census Bureau data. Details concerning the source data and methods for calculating the estimates are available in the methodology. The recent relative stability in the estimated size of the U.S. unauthorized immigrant population is a contrast to previous periods. The number of unauthorized immigrants in the U.S. rose through the 1990s and early 2000s, peaking at 12.2 million in 2007. The number of unauthorized immigrants declined in 2008 and 2009. As the U.S. unauthorized immigrant population has stabilized, it also has become more settled. 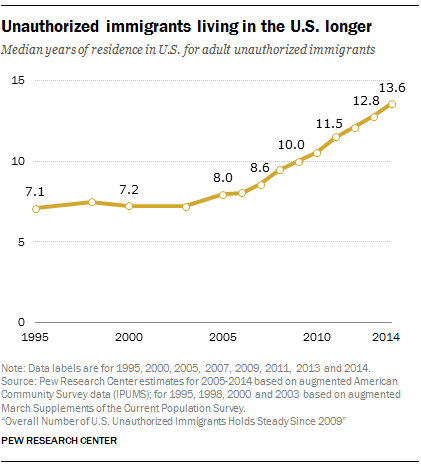 In 2014, unauthorized immigrant adults had lived in the U.S. for a median of 13.6 years – meaning that half had been in the country at least that long. In 2005, the median had been eight years, before rising to 10 years in 2009, the year the recession ended. Mexicans remain the majority of the nation’s unauthorized immigrant population, but their estimated number – 5.8 million in 2014 – has declined by about half a million people since 2009. Meanwhile, the number of unauthorized immigrants from all other nations – especially those from Asia and Central America – grew by 325,000 since 2009, to 5.3 million in 2014. The decline in unauthorized immigrants from some parts of the world, mainly Mexico, was roughly balanced by an increase in unauthorized immigrants from other parts of the world, so the total U.S. unauthorized immigrant population had no statistically significant change from 2009 to 2014. In contrast to the stable unauthorized immigrant total, the overall foreign-born population in the U.S. has gone up each year since 2009. The overall immigrant population rose by nearly 3 million from 2009 to 2014, reaching 43.6 million, even as its unauthorized immigrant component did not change. As overall net immigration from Mexico declined, immigration from Asia did not flag – indeed, it increased somewhat. As a result, among all newly arriving immigrants to the U.S., more now come from Asia than from Latin America, a change since 2008. After rising for decades, the number of unauthorized immigrants in the U.S. who are from Mexico began to decline from a peak of 6.9 million in 2007. Though the overall U.S. unauthorized immigrant population has stabilized since the recession ended in 2009, the total number from Mexico has continued to shrink and is now more than 1 million below its 2007 peak. A notable change that has fueled the decline in the population of Mexican unauthorized immigrants is a decrease in the number of new arrivals. Before the Great Recession, the number of new arrivals from Mexico exceeded the number of Mexican unauthorized immigrants who left the U.S. The decrease in the Mexican unauthorized immigrant population since 2009 indicates that departures have exceeded arrivals. At the national level, the rise in unauthorized immigrants from countries other than Mexico was driven mainly by an increase in those from Central America, Asia and sub-Saharan Africa. The number of unauthorized immigrants born in India, for example, grew by about 130,000 from 2009 to 2014, to an estimated 500,000. Many unauthorized immigrants from these nations arrived with legal status and overstayed their visas, according to Department of Homeland Security statistics. Homeland Security Secretary Jeh Johnson said recently that his agency is “doubling down” on preventing immigrants from Africa, the Middle East and other parts of the world from crossing illegally at the southwest border. Unauthorized immigrants increasingly are likely to have been in the U.S. for 10 years or more – 66% in 2014 compared with 41% in 2005. A declining share has lived in the U.S. for less than five years; only 14% had been in the U.S. for less than five years in 2014, compared with 31% in 2005. This overall change has been fueled by the decline in new unauthorized immigrants, especially those from Mexico. 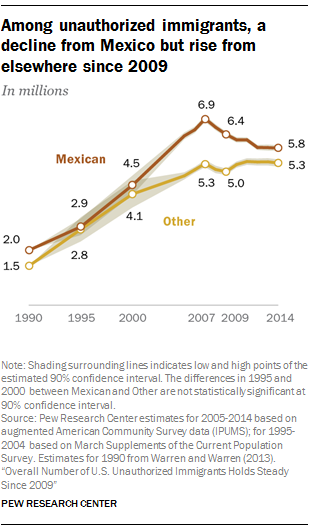 Among Mexican unauthorized immigrants, fully 78% had lived in the U.S. for 10 years or more as of 2014, and only 7% had been in the U.S. for less than five years. 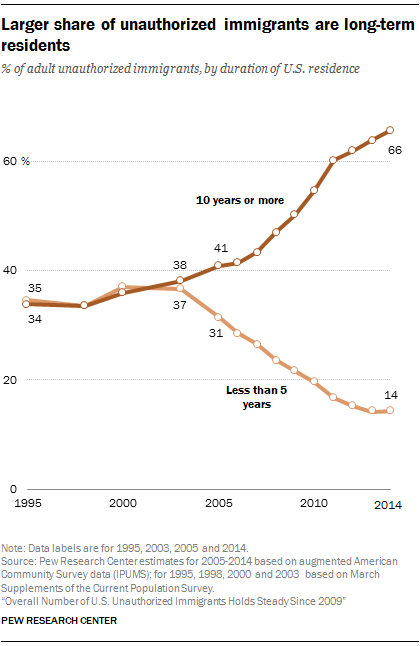 Among unauthorized immigrants from nations other than Mexico, a smaller share, but still a majority – 52% – had lived in the U.S. for at least a decade in 2014. Compared with Mexicans, a higher share of unauthorized immigrants from elsewhere – 22% – had been in the U.S. for less than five years. Because of historic immigration patterns between the U.S. and Mexico, unauthorized immigrants are more likely to be long-term residents in Western states. In California, home to the largest unauthorized immigrant population in the U.S., the median length of U.S. residence is 15.6 years, meaning that at least half have lived in the U.S. since the late 1990s. Some 71% of unauthorized immigrants in California are of Mexican origin. Unauthorized immigrant populations changed in 13 states from 2009 to 2014. In five of the six where populations rose, the change was due to an increase in unauthorized immigrants from countries other than Mexico. In all seven states where populations declined, it was due to a decline in the number of Mexican unauthorized immigrants. The overall estimated population of unauthorized immigrants went up in six states from 2009 to 2014. In five of them, the increase was due to the number of unauthorized immigrants from countries other than Mexico rising as the number of Mexican unauthorized immigrants either stayed the same (Massachusetts, Pennsylvania, Virginia and Washington) or declined (New Jersey). Only one state – Louisiana – saw an increase in its unauthorized immigrant population driven by an increase in Mexicans. In that state, the number of unauthorized immigrants from other countries did not change from 2009 to 2014. The estimated population of unauthorized immigrants went down in seven states from 2009 to 2014 because of declines in the number from Mexico. In six of those states – California, Georgia, Illinois, Kansas, Nevada and South Carolina – the estimated number of unauthorized immigrants from countries other than Mexico did not change. In the remaining state – Alabama – the total from other countries rose from 2009 to 2014, but the number from Mexico decreased more. In 2014, 59% of unauthorized immigrants lived in the same six states that have housed the majority of unauthorized immigrants for decades. California, with 2.3 million, has by far the largest number, followed by Texas, Florida, New York, New Jersey and Illinois. The unauthorized immigrant population had become much more dispersed around the country as numbers increased in nontraditional settlement areas. In 1990, 80% of unauthorized immigrants lived in the top six states; by 2005, the share had fallen to roughly the current level, 61%. Unauthorized immigrants accounted for 3.5% of the overall population and 26% of the nation’s 43.6 million foreign-born residents in 2014. 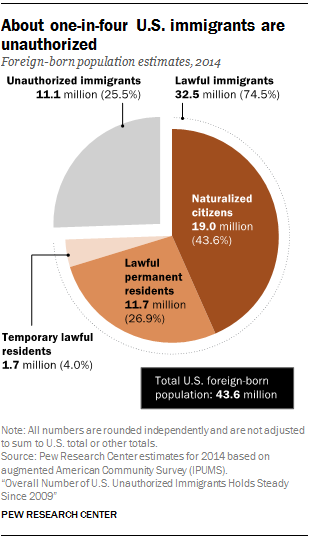 The U.S. foreign-born population also included 19 million naturalized citizens, 11.7 million lawful permanent residents and 1.7 million lawful residents with temporary status (such as students, diplomats and so-called “guest workers” in the technology sector). 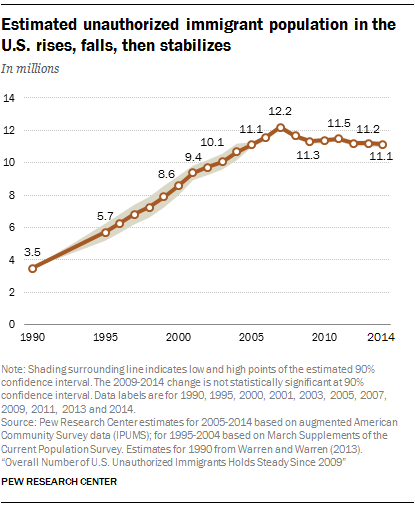 In total, immigrants represented 13.6% of the U.S. population in 2014. The issue of unauthorized immigration has played a prominent role in the 2016 presidential campaign. For more on the nation’s view of immigrants and immigration policy, see Pew Research Center surveys on this topic. The unauthorized immigrant estimates in this report are produced using a multistage method that first subtracts the estimated U.S. lawful foreign-born population from the total adjusted foreign-born population to derive a residual estimate of the unauthorized immigrant population. Then, the residual estimates serve as control totals in assigning legal status to individual respondents in the survey. The main source of data for 1995-2004 is the March supplement of the Current Population Survey, and for 2005-2014 it is the American Community Survey; both are conducted by the U.S. Census Bureau; see Methodology for more details. Because they are based on updated data, the new estimates of unauthorized immigrants for states and the nation in this report supersede (and in some cases revise) previously published Pew Research Center estimates. The most notable of these revisions is that previous estimates showed a decrease in the unauthorized immigrant population in Massachusetts from 2009 to 2012; the updated numbers show no significant change for those years and a subsequent increase by 2014. All trends have been updated to reflect current data. See Methodology for more details. Unauthorized immigrants include those who enter the country without legal permission and those who overstay their visas. About 10% of unauthorized immigrants have been granted temporary protection from deportation under two government programs. They include more than 728,000 young adults who were brought to the U.S. as children and successfully applied for President Barack Obama’s 2012 Deferred Action for Childhood Arrivals program. (An additional 4 million young adults and their parents would have been eligible under an expansion that has been blocked by a federal court.) An estimated 326,000 immigrants, mostly from Central America, have been granted Temporary Protected Status because of disease, natural disaster or conflict in their home countries. The Pew Research Center estimates of the unauthorized immigrant population also include some people who have applied for asylum status but whose applications have not been processed. As of April 2014, about 45,000 cases of principal applicants were pending; if family members are included, that total might rise to as much as 75,000. “Foreign born” refers to an individual who is not a U.S. citizen at birth or who, in other words, is born outside the U.S., Puerto Rico or other U.S. territories and whose parents are not U.S. citizens. The terms “foreign born” and “immigrant” are used interchangeably. “U.S. born” refers to an individual who is a U.S. citizen at birth, including people born in the United States, Puerto Rico or other U.S. territories, as well as those born elsewhere to at least one parent who is a U.S. citizen. The “lawful immigrant” population is defined as naturalized citizens; people granted lawful permanent residence (previously known as legal permanent residence); those granted asylum; people admitted as refugees; and people admitted under a set of specific authorized temporary statuses for longer-term residence and work. “Unauthorized immigrants” are all foreign-born non‑citizens residing in the country who are not “lawful immigrants.” These definitions reflect standard and customary usage by the U.S. Department of Homeland Security and academic researchers. The vast majority of unauthorized immigrants entered the country without valid documents or arrived with valid visas but stayed past their visa expiration date or otherwise violated the terms of their admission. Some who entered as unauthorized immigrants or violated terms of admission have obtained work authorization by applying for adjustment to lawful permanent status, obtaining Temporary Protected Status (TPS) or receiving Deferred Action for Childhood Arrivals (DACA) status. This “quasi-lawful” group could account for as much as about 10% of the unauthorized population. Many could also revert to unauthorized status.